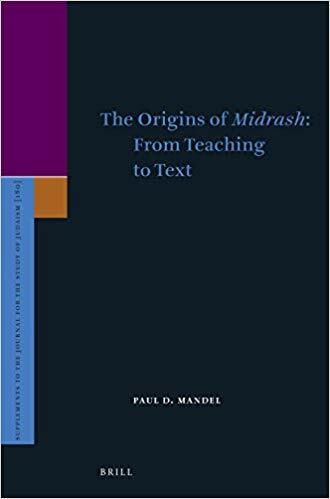 Paul D. Mandel, The Origins of Midrash: From Teaching to Text. Supplements to the Journal for the Study of Judaism 180. Leiden and Boston: Brill, 2017. Harold Bloom once wrote that “[y]ou don’t have to be Jewish to be a compulsive interpreter, but, of course, it helps.” Bloom’s comment comes in the context of a discussion of Kafka and Freud, writers “so strong and so Jewish that we redefine the Jewish on their basis.” But what about them, Bloom asks, is Jewish? He answers that “their Jewishness consists in their intense obsession with interpretation, as such.” After all, who captures the image of “compulsive interpreter” better than Freud? And who like Kafka begs interpretation while simultaneously denying the possibility of interpretation? For Bloom, these compulsive Jewish interpreters are intellectual heirs of the ancient rabbis, those early exegetes, who—to the point of obsession—commented and argued on every jot and tittle of the Hebrew Bible: “What Jewish writing has to interpret, finally, and however indirectly, is the Hebrew Bible.” Midrash is both the activity in which the rabbis partook and the noun describing a corpus they created, and not only has it served as a model for later Jewish writers, but it has also served as an object of fascination for scholars from Origen to Jerome, De Rossi to Delitzsch, Hartman to Handelman, and Buxtorf to Bloom. Mandel’s argument is a philological one, and it starts over a millennium before the rabbis first appeared on the historical stage. In the first half of the book, Mandel addresses usages of words from the Semitic root d.r.sh, along with usages of the adjacent root s.p.r and a number of related non-Semitic words. In their occurrences in pre-rabbinic texts from the Hebrew Bible and elsewhere, these words refer not to activities of textual interpretation, but simply to “the disclosure and teaching of the Jewish law” (168). Similarly, in early rabbinic texts, these words “do not convey a particular mode of textual interpretation and, indeed, are not limited to textual interpretation at all, but rather to public instruction, usually in the realm of laws and custom” (280). The meaning of d.r.sh changed towards the close of the tannaitic period, around the turn of the second century CE. Mandel admits that “[s]everal causes may be suggested for this development,” and that further research is needed, although the reason that he prioritizes is “the codification of the orally transmitted law into a fixed text (mishnah) and the subsequent development of particular analytic tools to be used on this text as well as on Scripture” (304). Over the course of the second century CE, “the law and other traditions, including those derived from Scripture, were codified in orally transmitted corpora to be recited (shanah) by the ḥakham and his disciples” (292). This process began with R. Akiva, and therefore, the place of midrash as textual interpretation and not just as general instruction is more pronounced in his comments and in those of his pupils than it is in those of R. Ishmael and his disciples. Mandel attributes R. Ishmael’s conservatism to his priestly lineage. On the most basic level, Mandel’s book serves as a linguistic corrective that helps us better understand many texts from the Second Temple and early rabbinic periods. Given Mandel’s argument that d.r.sh may not refer to textual interpretation, we must return to the texts that use that root. Mandel does much of this work already, providing re-readings of dozens of such passages throughout the book, starting with Ezra and continuing well into the Common Era. Cumulatively, the significance of Mandel’s re-readings goes far beyond case-by-case correctives. One of the central contributions of Mandel’s book is its implications for the way in which Jewish scholarship during the late Second Temple and early rabbinic periods should be characterized. Arguing against James Kugel’s description of the later Second Temple and early rabbinic periods as one of intense biblical commentary, Mandel writes that “[t]he limitation of the use of the passages discussed in this book to legal-instructional contexts shifts the balance of evidence for an all-encompassing ‘age of interpretation,’ and raises questions regarding the locus for the interpretation of Scripture during this period” (294). Mandel’s conclusion is thus similar to those of E.E. Urbach, Adiel Schremer, and Aharon Shemesh, all of whom have pointed to the paucity of exegesis in many Second Temple period legal traditions, and it is in line with the conclusion of another recent book, Eva Mroczek’s The Literary Imagination in Jewish Antiquity. Mroczek also argues against the “age of interpretation” model, yet she does so by reconsidering the conceptions of “book” and “bible” that scholars have brought with them when studying these periods. In terms of Mandel’s contribution to our understanding of rabbinic texts and culture, the precision that he brings allows for a more refined understanding of rabbinic education in Palestine. Mandel devotes an important section of his book to the term beit midrash (182-211). By focusing on this very specific term as well as on a number of adjacent terms like beit sefer and beit talmud, Mandel is able to reconstruct a diachronic picture of rabbinic education. According to Mandel, in the early tannaitic period students began their primary studies in a general house of study termed beit talmud before they studied directly from teachers by serving as their personal disciples or apprentices, in a practice the rabbis termed shimush ḥakhamim. During the early tannaitic period, advanced discussions between rabbis took place in a beit va’ad (house of assembly). The beit midrash, however, referred not to a physical institution, but to the practice of public gatherings on the Sabbath and Holidays at which the rabbis engaged in instruction to the wider public. By the beginning of the early third century CE and continuing into the amoraic period proper, the beit talmud began to refer specifically to institutions in which students received instruction in the Oral Torah, whereas the beit sefer referred to a separate institution, akin to a primary school, that was dedicated to the instruction of the Written Torah. It is at this time that the beit midrash became primarily a physical institution in which the rabbis engaged in their own study amongst themselves, and not in public instruction. This shift, Mandel suggests, “can be seen as the result of an increasing textualization of ancient law” that came to fruition with the eventual publication of the Mishnah (210). Some of Mandel’s re-readings are more convincing than others. Not all will be convinced by the argument that the “doresh ha-torah” of The Damascus Document, 1QS, and other texts from Qumran is not an exegete per se, but rather a “teacher of newly revealed laws and prophecies” (116; emphasis in the original). Moreover, not all of the readings of rabbinic texts in which Mandel argues that midrash does not refer to textual commentary are convincing. Mandel is explicit in stating that “[t]his book is about a word” (9), and that he does not address “the general question of biblical interpretation during these periods” (293). While Mandel is certain that the evidence he gathers can nonetheless shift “the balance of evidence for an all-encompassing ‘age of interpretation’” (294), his argument would be stronger had he better situated his conclusions regarding the word darash within the larger context of biblical interpretation during the periods under discussion. [t]he discussion of laws during the Sabbath convocations of the Pharisees may have included a recital of the pertinent passages from Scripture, such as the scriptural readings that the Mishnah specifically prescribes for the holidays (m. Meg. 3:4-5). Nonetheless, it seems that the main focus of these Sabbath convocations was not an explication of the Torah text, but rather a detailed discussion of the laws based on that text (163; emphasis added). It seems, though, that the distinction between “explication of the Torah text” and “a detailed discussion of the laws based on that text” is not so clear, particularly given that the discussion of the laws may still “have included a recital of the pertinent passages from Scripture.” A theoretically grounded and methodologically rigorous discussion of what counts as commentary could have served Mandel in explaining why in this and other cases what we are seeing is not commentary. A rather different problem with the book relates to the roles of social institutions in early rabbinic culture. As mentioned, Mandel carefully reconstructs a vivid image of rabbinic education in Palestine during the tannaitic and amoraic periods, describing the diachronic changes in the program of study and in the structure of educational institutions. For Mandel, the changes in institutions are primarily linked to the changes in the program of study—he suggests that the growing textualization of rabbinic traditions and halakha, culminating in the Mishnah, is what resulted in the eventual changes in the institutional aspects of rabbinic education. Yet perhaps the relationship is more complicated than that—after all, we are speaking of both physical edifices and of the edification of Jewish youth, two things that require a significant amount of financing. Mandel is not the first to isolate institutional changes that occurred toward the end of the tannaitic period, and in similar cases, other scholars have cautiously pointed to what may be the increasing political power of the incipient Patriarchate. The issues raised here in no way detract from the overall importance of the book, but rather bear witness to the range, learnedness, and generative nature of Mandel’s discussions. The book includes extensive indices, prepared in part by Fern Seckbach (xiii), which give a sense of the immense scope of the book: “Modern Authors”, “Words and Phrases” (in fifteen languages! ), “Passages Cited” (divided into thirteen categories), and a fourteen-page “Index of Subjects.” In light of the number of texts, scholarly opinions, and words analyzed by Mandel, the indices allow the book to serve not only as an important piece of original scholarship in its own right, but also as an invaluable reference work on the early stages of Jewish exegesis. According to Bloom, interpreting the Hebrew Bible has always “been the function of Jewish writing, or rather its burden.” In re-opening the question of the origins of midrash, Mandel has written a book that forces us to rethink some of the essential features of Jewish literary culture. This book will surely have a lasting impact on the study of one of the most formative shifts in the history of Judaism. Yitz Landes is a Ph.D. student at Princeton University. Harold Bloom, “Foreword,” in Zakhor: Jewish History and Jewish Memory, by Yosef Hayim Yerushalmi, Samuel and Althea Stroum Lectures in Jewish Studies (Seattle and London: University of Washington Press, 1996), xiii–xxv, (xxiii). For a recent statement of the consensus understanding of the word midrash, see Steven D. Fraade, “The Innovation of Nominalized Verbs in Mishnaic Hebrew as Marking an Innovation of Concept,” in Studies in Mishnaic Hebrew and Related Fields: Proceedings of the Yale Symposium on Mishnaic Hebrew, May 2014, ed. Elitzur A. Bar-Asher Siegal and Aaron J. Koller (New Haven and Jerusalem: The Program in Judaic Studies of Yale University and The Center for Jewish Languages and Literatures of The Hebrew University, 2017), 129–48 (138-9). See in particular pp. 276-284, for a comparison between the schools of R. Akiva and R. Ishmael. In addition to the literature cited in this section by Mandel, two relevant Hebrew University dissertations directed by Menahem Kahana have since appeared: Assaf Rosen-Zvi, “Text, Redaction and Hermeneutic in Mekhilta de-Rabbi Ishmael, Tractate Kaspa” (Ph.D. dissertation, The Hebrew University of Jerusalem, 2016) [Hebrew] and Hallel Baitner, “Studies in the Mishnah of Sifre Zuta and Its Integration into the Midrash” (Ph.D. dissertation, The Hebrew University of Jerusalem, 2017) [Hebrew]. See also an earlier article by Kahana, unutilized by Mandel: Menahem I. Kahana, “The Relations between Exegeses in the Mishnah and Halakhot in the Midrash,” Tarbiz 84, no. 1/2 (2015): 17–76 [Hebrew]. See in particular James L. Kugel, “The World of Ancient Biblical Interpreters,” in Traditions of the Bible: A Guide to the Bible as It Was at the Start of the Common Era, by James L. Kugel (Cambridge and London: Harvard University Press, 1998), 1–41, cited in Mandel, The Origins of Midrash, 294 n. 8. See E.E. Urbach, “The Drasha As a Basis of the Halakhah and the Problem of the Soferim,” Tarbiz 27, no. 2–3 (1958): 166–82 [Hebrew], Adiel Schremer, “‘[T]he[y] Did Not Read in the Sealed Book’: Qumran Halakhic Revolution and the Emergence of Torah Study in Second Temple Judaism,” in Historical Perspectives: From the Hasmoneans to Bar Kokhba in Light of the Dead Sea Scrolls - Proceedings of the Fourth International Symposium of the Orion Center for the Study of the Dead Sea Scrolls and Associated Literature, 27-31 January, 1999, ed. David M. Goodblatt, Avital Pinnick, and Daniel R. Schwartz, Studies on the Texts of the Desert of Judah 37 (Leiden and Boston: Brill, 2001), 105–26, and Aharon Shemesh, Halakhah in the Making: The Development of Jewish Law from Qumran to the Rabbis, Taubman Lectures in Jewish Studies 6 (Berkley: University of California Press, 2009). Much of this section appeared earlier in a Hebrew article: Paul D. Mandel, “Concerning the Public Role of the Early beit midrash,” Zion 79, no. 3 (2014): 327–43 [Hebrew]. Mandel here is chiefly challenging the conclusions of Haim Shapira, “Beit ha-Midrash (the House of Study) during the Late Second Temple Period and the Age of the Mishnah: Institutional and Ideological Aspects” (Ph.D. dissertation, The Hebrew University of Jerusalem, 2001) [Hebrew]. Unmentioned by Mandel is the recent dissertation of Shimon Fogel, “The Orders of Discourse in the House of Study (beit midrash) in Palestinian Rabbinic Literature: Organizing Space, Ritual and Discipline” (Ph.D. dissertation, Ben-Gurion University of the Negev, 2014) [Hebrew]. This approach is similar to the one taken decades ago by David Goodblatt in his study of the rabbinic academies in talmudic Babylonia (David M. Goodblatt, Rabbinic Instruction in Sasanian Babylonia, Studies in Judaism in Late Antiquity 9 [Leiden: Brill, 1975]). Goodblatt has summarized the history of his approach as follows: “The consensus approach assumed that these materials were historically accurate and therefore allowed them to provide the framework within which the amoraic evidence is understood. However, this assumption needs to be demonstrated. After all, it is possible that medieval authors possessed only limited knowledge of the preceding centuries. As a result, they may have projected the institutions and practices of their own day back into talmudic times. The more critical approach involves beginning with evidence from the period under study, namely, the amoraic sources. Only then should one turn to the medieval sources. In this way one can control the possibility of anachronism. The difficulty with this alternative approach is that the amoraic sources appear to have so little to say about the academies, as already noted. One way around the difficulty lies in engaging a philological approach which involves collecting and analyzing the various terms and phrases used by the amoraic sources for academic institutions and learning situations. The frequency with which these locutions appear and their distribution, both chronological and geographical, may relate information not explicitly stated in the sources, and careful attention to context may clarify their exact connotations.” David M. Goodblatt, “The History of the Babylonian Academies,” in The Cambridge History of Judaism, Volume 4: The Late Roman-Rabbinic Period, ed. Steven T. Katz (Cambridge: Cambridge University Press, 2006), 821–39 (830-1; emphasis added). Particularly surprising for some may be the fact that only one paragraph is devoted to the evidence of Ben Sira, with the rather quick conclusion that “Ben Sira’s sofer is not one who is involved with texts” (68). See Seth Schwartz, The Ancient Jews from Alexander to Muhammad (Cambridge: Cambridge University Press, 2014), 118. Mandel looks briefly at the relatively contemporary training of Roman jurists, descriptions of which “bear a remarkable resemblance to those of the early ḥakham” (214). As he notes (212 n. 104), “[c]omparison between the Roman jurists and the rabbinical legal activity can be found” already in a number of earlier studies. Also of relevance, I may add, is the growing body of scholarship on education in the Mediterranean world at this time, as it seems likely that the institutions Mandel describes may not have only trained rabbis to serve in roles akin to those of jurists, but that they may have also, perhaps, educated some Jews who did not ultimately go on to serve in such positions. See in particular Raffaella Cribiore, Gymnastics of the Mind: Greek Education in Hellenistic and Roman Egypt (Princeton and Oxford: Princeton University Press, 2001).